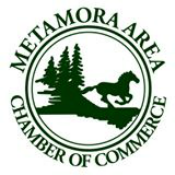 The Metamora Area Chamber of Commerce is proud to offer two $500 scholarships to two outstanding students. Over the past 20 years, the Chamber has awarded $20,000 to area youth. Be a graduating high school, home school or adult education student with an affiliation with the Metamora Area. Submit an essay - "What this scholarship means to me?" Be enrolled in college, university or trade school. Describe citizenship and service to the community or school. Demonstrate involvement in business world or related training.